I just came across this Steve Kimock feature I wrote for Relix in 2005, just before moving to China. I thought it was pretty swell. Enjoy. It’s 8:10 pm at New York’s Bowery Ballroom. Doors were supposed to open ten minutes ago and a few people are sitting on the grimy lower East Side sidewalk waiting to enter, but the Steve Kimock Band is still on stage soundchecking. Hey, these things happen in rock and roll. People oversleep, vans get stuck in traffic, road managers are too hungover to function. But this is different. Kimock and his quartet have been up there for almost two hours, getting every frequency range of every instrument just right, before working out a couple of new tunes. This is not an aberration; it is what the Steve Kimock Band does most nights. And that is an aberration. As unusual as it is, Kimock and company’s quest for perfection makes perfect sense once you hear their trance-inducing instrumental rock. Kimock feels the stage has to be set up just right to achieve the balance so crucial to capture his music’s essential every-note-clean-and-precise sound. No doubt his compulsiveness is also fueled by the fact that after 30 years as a professional guitarist, he is finally stepping out on his own. 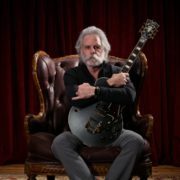 After being a member of Zero and KVHW and a sideman for the likes of The Other Ones, Phil and Friends and Bruce Hornsby, this is finally his chance to fully express his musical vision, which is both unique and ambitious. Kimock’s small waves provide his music an edge, while also adding a degree of mystery and, at times, frustration. You can innately recognize that you are only hearing a tiny fraction of his musical mind, which makes it compelling. You find yourself leaning forward to see what will come next, on the edge of your seat waiting for the explosion that he often hints at but doesn’t always deliver. The intense climaxes that are most rock guitarists’ stock resolution only occasionally present themselves. You can see all of this for yourself on the recently released DVD Live at the Gothic Theatre, which captures the band’s New Year’s Eve performance. 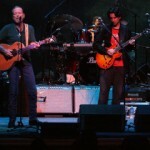 The band also self-released the two-CD set Live in Colorado, Vol 2, featuring music recorded the prior night (December 30, 2003). 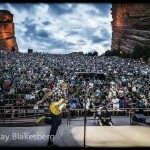 All of this as well as more live recordings is available at kimock.com. More importantly, the Steve Kimock Band also recently recorded a new studio album, with Alphonso Johnson playing bass. Everyone involved is extremely excited about the results, which should be available some time this fall, either self-released or through one of the several labels with whom Kimock’s wife and manager Jen is currently speaking. Until that comes out, Kimock will continue to win fans over one at a time. Getting them to check him out is the hard part. Winning them over once they experience the music is much easier. Dead guitarist Jimmy Herring still remembers the first time he heard Kimock when they played a show together years ago, when Herring was in the Aquarium Rescue Unit and Kimock was playing with Merle Saunders. Kimock always plays through a 50-watt Dumble, a rare and magnificent beast that is at the heart of his sound. Unlike almost any other band, Kimock and co. do not use stage monitors, the speakers through which musicians generally hear themselves. Instead, they are listening and reacting to only the amps and the house (audience) sound. 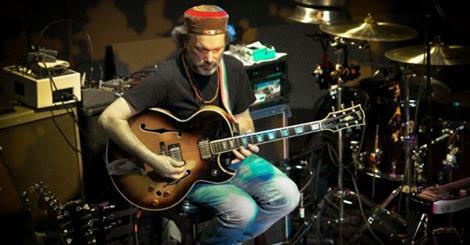 Kimock plays a wide assortment of fairly eccentric guitars – even his Strat is heavily modified, with unusual pickups. He only occasionally uses a small number of vintage effects and keeps them unplugged and out of his chain when not in use, a departure from a more standard pedal board, which the signal always passes through. Nothing comes between him and his Dumble. Kimock carves out his music, letting fly little clusters of notes that are so clean and crystalline that it seems you could reach out and touch them. His playing is often sparse and sometimes spacey and comes from deep within, too instinctual to be called cerebral. Because Kimock leaves so much white space around his notes, he needs a band that is ready to respond and fill in some gaps. Drummer Rodney Holmes is a perfect foil, a remarkably explosive, highly creative musician, whose soulful pulse keeps the music moving forward no matter how horizontal Kimock’s playing gets. The two feed off each other, tossing ideas and phrases back and forth, clearly grooving off of each other’s creative sparks. Though there is often full group interaction, at other times guitarist Mitch Stein, keyboardist Jim Kost and relatively new bassist Leo Traversa only add coloring, melodic contour and harmonic structure to Holmes and Kimock’s dynamic improvisations. Holmes joined Kimock about four years ago, fresh off a three-year stint in Santana, which included playing several tracks on the multi-platinum Supernatural, including the hit single “smooth.” Prior to that, the Bronx native played primarily in jazz bands with the likes of Joe Zawinul and the mighty Wayne Shorter. 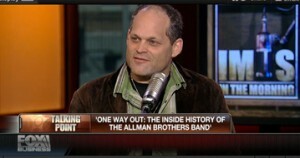 He had no exposure to the jam band world before hooking up with Kimock. Holmes is a fantastic player – one of the very best I’ve seen in many years of listening to music. He and Kimock are different in many ways but they share a monastic devotion to music and an ability to be completely present in the moment, totally immersed in their playing. 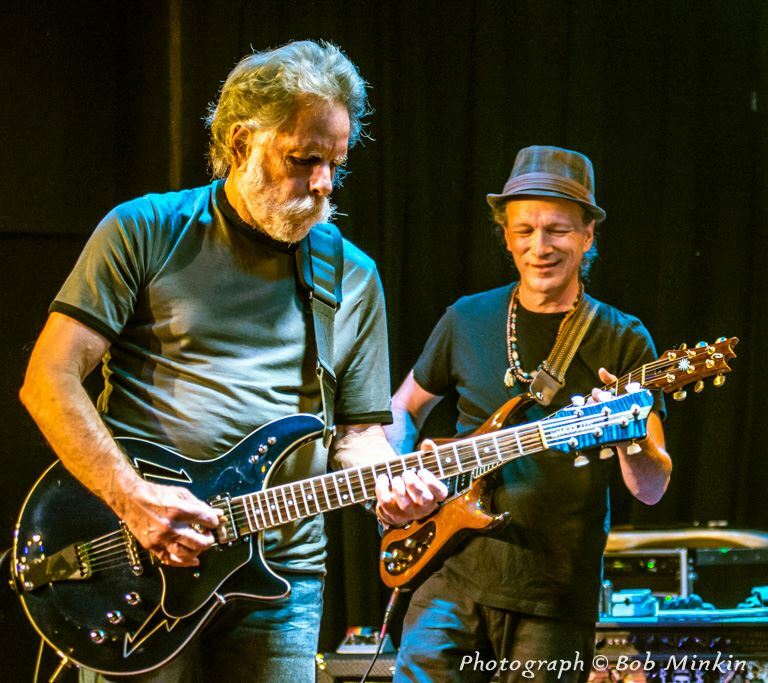 Frank Goodman, the co-leader of The Goodman Brothers, Kimock’s first real professional band and the group with whom he moved from Bethlehem, PA to San Francisco in the early 70s, remembers meeting the guitarist, who was all of 18 and living alone in a basement apartment. 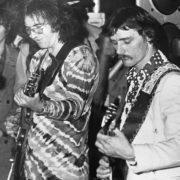 The Goodman Brothers and a veritable commune of people moved out to the Bay Area and soon established themselves, playing around frequently. They also befriended the folks at Mesa/Boogie, at the time a tiny boutique amp maker. Goodman started making footswitches, while Kimock, always a gear junkie and tech nut, became the company’s customer answer man. He worked off and on at Mesa for years and jokes that his time card was only recently tossed out. Today Kimock is an engaged father of three, living with Jen, their baby son Skyler and, half the year, his teenaged son John in a farmhouse back in small town Pennsylvania. But he spent years living virtually homeless and underground in the Bay Area. “I love having a house with a pond and big trees, beautiful children and a lovely wife,” he says. “It’s fabulous, but I was pretty happy living in a tree, too. You go through changes. I seriously floated for a long time. I didn’t have a driver’s license for almost 10 years. I walked everywhere and lived in the woods, completely disconnected from society. “It was just clouds of notes,” he says. “I played all kinds of really fast, really fancy stuff all the time. I was attracted to achieving a virtuoso level of proficiency and I took it pretty far. Then I found a book in a 50-cent bin called Zen Mind, Beginner’s Mind and I took it to heart. Whenever it said ‘life’ I substituted ‘guitar’ and changed my whole approach. 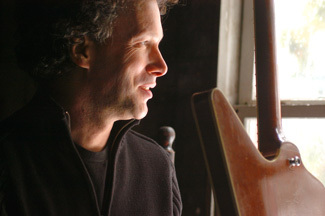 Kimock gigged around with many people before ending up in Zero, with whom he played for over a decade, developing a very large West Coast audience. 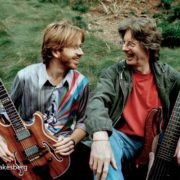 During this run, Jerry Garcia named him as his “favorite unknown guitarist” and people started mentioning the two in the same breath more and more often. It had a lot to do with the similarity in their clean tone and also the fact that Kimock popped up in bands with Bob Weir, Keith Godchaux and Merle Saunders, amongst other Dead members or friends. 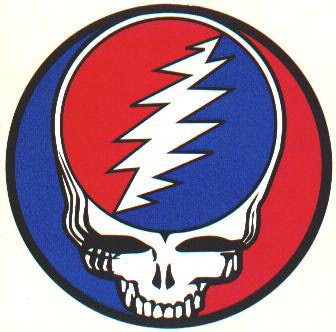 Still, when the Dead’s surviving members reunited for the first time in 98 as the Other Ones, Kimock and Mark Karan were the featured guitarists. 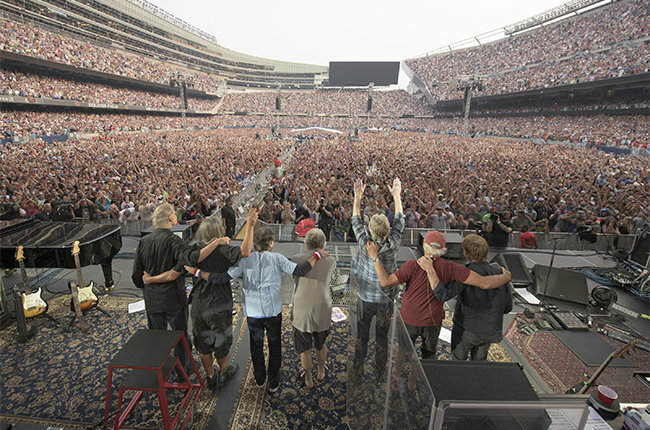 That gig led to Kimock being a charter member of Phil Lesh’s Phil and Friends, with the two of them and drummer John Molo joined by an ever-rotating cast. Kimock was the one regular member in Phil Lesh’s rotating cast of Friends, starting with their first shows in April ’99, before leaving abruptly after one show of a joint tour with Bob Dylan in the Fall of ’99 tour. His departure has been a source of much curiosity in the Deadhead community, but he’s not eager to discuss it at length. So here he is. Kimock is pushing 50 but looking obscenely young, his face unlined, his body lean. His biggest fans think he should be well past the great cult player status and out of playing clubs like the Bowery, but he is remarkably non-bitter. Kimock finishes restringing his white Strat, plays a couple of sliding jazzy chords and looks back up across the guitar’s neck.